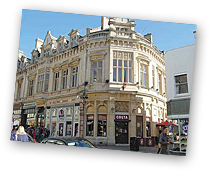 Previously known as Cheltenham Art Gallery and Museum, The Wilson first opened its doors to the public in 1899. A short walk from our five-star Cheltenham apartment, it was renamed The Wilson in 2013 when it was rebranded after the building was extended. As Gloucestershire’s premier art gallery and museum, The Wilson houses a fascinating and rare collection of artefacts and items of historical interest. Items on show include displays of world-renowned Arts and Crafts Movement furniture, jewellery and ceramics, as well as fine art, the Edward A Wilson Gallery, and the Emery Walker Library. The Wilson is also home to several touring and static exhibitions – you’ll find full details of the latest exhibits on display on the gallery’s website. Fancy a dose of culture in your stay? The Wilson is just a five minute stroll from the luxury apartment at 24 The Promenade. Get in touch today to book your stay.